Known only from the Rio Orinoco drainage, Venezuela. It inhabits flowing waters with rocky substrates, where it lives amongst the rocks. A stream-type setup with a gravel or sand substrate and rounded stones and rocks would simulate its natural biotope, but it’s equally at home in a planted tank. It does require well-oxygenated water, however, and live plants tend not to do so well under these conditions. It also prefers a degree of current running through the tank. Temperature: No specific data avilable. It should be happy in the range 72-79°F (22-26°C), based on the preferences of other species from the same region. Feeds on aufwuchs and small aquatic crustaceans in nature. In the aquarium, it proves omnivorous and will accept both sinking dried foods and live and frozen stuff such as bloodworm or daphnia. A decent choice for the community tank. In a biotope setup, good tankmates include characins such as Anostomus, Hemiodus, Semaprochilodus and Metynnis species, reophilic cichlids such as Retroculus and other Loricariids requiring similar conditions. It can also be kept in a more general community, if you wish. If you’re keeping more than one, ensure each has it’s own refuge to call home, and expect some territorial bickering. This species was only described to science in 2005, the species name being taken from the name of a local tribe. 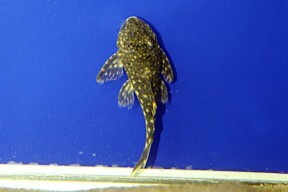 It’s also known as the spotted orange seam plec, due to its patterning. 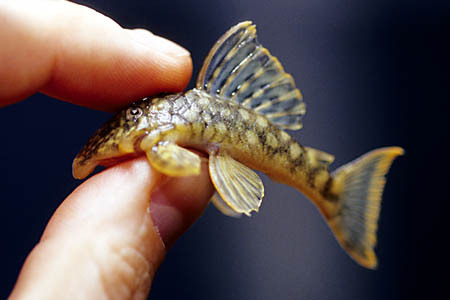 It’s found living alongside other Loricariid species in nature, including Peckoltia and other Hemiancistrus species. There’s ongoing discussion as to whether this species and the currently undescribed L122 are one and the same, as these two were apparently both included in the scientific description mentioned above. Based on shape, the two would appear to be distinct, as L122 has a flatter profile than H. guahiborum.